Brandon Cobb said his local knowledge probably paid dividends on day 1 of the Lake Hartwell Bassmaster Elite Series. 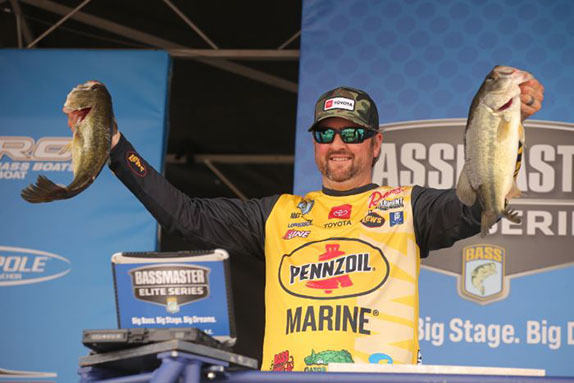 There's a greater weight differential between 1st place and 2nd after day 1 of the Lake Hartwell Bassmaster Elite Series than there is between 2nd and 10th. That's how tight the leaderboard is following a day when only one angler surpassed 18 pounds, but 29 caught at least 14. Brandon Cobb, a 29-year-old resident of Greenwood, S.C. who's intimately familiar with the big lake that sits on the border that his home state shares with Georgia, boxed 19-09 to give himself a 2-pound advantage over the rest of the 74-angler field. Hank Cherry and Micah Frazier are tied for 2nd with 17-09 and Matt Arey and Scott Canterbury round out the top 5 with 16-15 and 16-14, respectively. In the days leading up to the event, Cobb said he felt like any local advantage he possessed would be negated by the multitude of fish that were in shallow water to participate in the annual reproduction ritual. He backed off that notion a bit after the initial weigh-in. "I think it helped today because the lake is fishing kind of weird," he said. "Then again, a lot of the stuff I know to do isn't working." Veteran Todd Auten, another South Carolina resident, leads the bottom half of the top 10 with 16-13. He's followed by John Crews (16-09), Bill Lowen (16-00, Brad Whatley (15-14) and Matt Herren (15-10). Only two anglers failed to weigh a five-fish limit and just six came to the scale with a bag weighing less than 10 pounds. Conditions were ideal for sight-fishing (sunny skies and not much wind) and a lot of visible fish were pulled off beds and treated to a boat ride. That likely won't be the case on day 2, as the WeatherChannel.com forecast calls for ran that should continue for much of the day. The field will be cut to the top 35 after Friday's weigh-in. That position is currently occupied by Jesse Tacoronte with 13-07, but the next 19 anglers are within 2 pounds of his weight. Cobb said the cut weight will likely be a little shy of the almost 27 pounds that would represent a doubling of Tacoronte's haul. 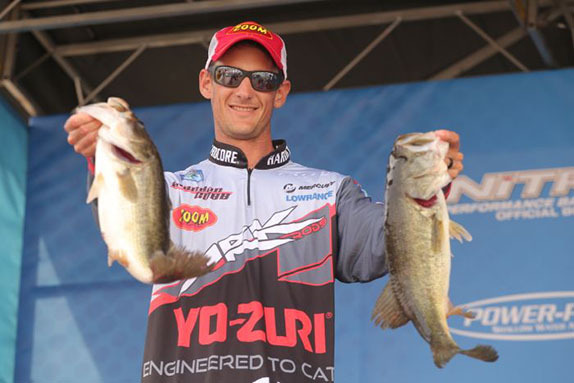 Micah Frazier had a horrible practice, but scrambled to catch five solid fish on day 1. "I expect to see a drop-off," he said. "Normally you don't see that at Hartwell, but because the spawn is kind of strange this year (due to some chilly weather in March), there's not a huge wave of fish up right now. The weights should go down." Cobb looked at a couple of fish that he weighed in and was pretty sure that at least two more, although not visible, were spawning. He went through about 15 keepers and his bag was topped by a 4 1/2-pounder. "I lost one pretty big one that I believe was on a bed," he said, "and honestly, I forgot to go back to it. I'll start on that tomorrow. "In practice I saw a lot of fish that were paired up. Today it seemed like a lot of the females were gone, but there's still some bucks. They should bite tomorrow, but the problem is going to be knowing where to put your bait. You're not going to be able to see the fish or the light spot where the bed is." He's hoping for intermittent rain and not a consistent downpour. "If it's off and on, it won't be as bad because as clear as Hartwell is, you can still see what you need to when it's cloudy. Constant rain will make it tough on everybody." Frazier, a Georgian with a fair amount of Hartwell experience, said he had a horrible practice and scrapped everything for day 1. He weighed three sight-fish, one that bit a topwater and one that was enticed by a soft-plastic offering. A 4-pounder was his biggest specimen and he caught that one blind-fishing. "I just ran a lot of new water," he said. "I went up one of the rivers and went fishing. I fished pockets in areas I haven't been to this week, but where I've caught some in the past. "It sort of feels like home because I grew up fishing these kinds of lakes, but I never come here unless it's for a tournament. It's a 2 1/2-hour drive, but I have to go through Atlanta to get here and you never know what's going to happen with that." 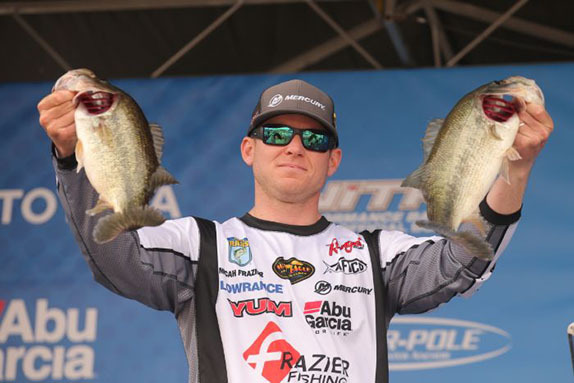 Matt Arey exceeded his goal for the day by a couple of pounds. He has no idea whether he can repeat his success on day 2. "I just had a good day and caught five good fish. I wish I was on something, but I'm really now. Somehow I ended up with what I had and I didn't leave any fish for tomorrow or anything like that. "I've been thinking about what else I can tie on for tomorrow because I know it's going to be a lot different. There's not a lot of fish up � I expected to see more today. There weren't any new ones in the areas I practiced in and I don't get the feeling that fresh fish are moving in. I don't know how to fish for fish that I can't see, but I know I'll have to do some different things." Arey was hoping to catch 14 to 15 pounds and easily exceeded that mark. His sack contained two fish that was just an ounce shy of 4 pounds. The dozen keepers he caught included a couple of sight-fish, but only weighed in one of those. He lost a couple of fish, but doesn't think either would've aided his cause. "With the weather that's coming in, I'm probably going to have to can everything I'm doing now and start over from scratch," he said. "We're going to have all kinds of conditions before this is over and it's going to come down to whoever makes the best adjustments. "What I did today was a real finessey deal with light line. With the wind and rain tomorrow, the conditions aren't going to be conducive to that." > Day 1 stats � 74 anglers, 72 limits, 1 four, 1 three.